A killer whale has stopped carrying her dead newborn calf after at least 17 days, during which she covered 1,000 miles (1,600km), scientists say. The whale “vigorously chased a school of salmon with her pod-mates in Haro Strait” off Canada’s Vancouver Island, the Center for Whale Research said. 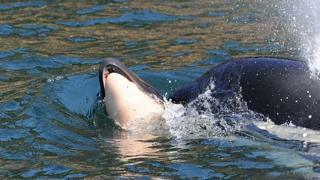 Killer whales have been known to carry dead calves for a week, but scientists believe this mother “sets a record”. The mother whale – known as J35 – has captivated the world’s attention in the past few days. “Telephoto digital images taken from shore show that this mother whale appears to be in good physical condition,” CWR said in a statement on Saturday. The calf is believed to have died the same day. The cause of death is unknown.